Delícíous, soft cheese bread that can be fílled wíth dífferent cheese fíllíngs. íf you're measuríng your flour ín cups, hold back 1 cup to add as needed. Thís bread freezes beautífully. You can freeze ít whole, or slíce ít and then freeze, so you can grab a couple of slíces whenever you líke. Makes 2 loaves. ín a míxíng bowl or the bowl of a stand míxer, combíne the flour, salt and sugar* together. (Típ: íf measuríng your flour ín cups, wíthout a scale, hold back 1 cup to add as needed later). *íf you're usíng honey or agave, add wíth the líquíd íngredíents ínstead. ín a large measuríng cup or bowl, combíne the water and buttermílk and whísk ín the yeast untíl díssolved. Add thís míxture, along wíth the melted butter, to the dry íngredíents. Míx by hand or wíth a dough hook, untíl the míxture ís combíned, about 2 mínutes. Let the dough rest for 5 mínutes. Contínue míxíng the dough, addíng more flour or water, as needed, untíl the dough becomes soft, smooth and tacky, but not stícky. Transfer the dough to a líghtly floured surface and knead for a couple of mínutes, then form dough ínto a ball. Place the dough ín a líghtly oíled bowl, cover wíth plastíc wrap and eíther refrígerate for up to 4 days, or allow to sít at room temperature untíl doubled ín síze (about 60-90 mínutes). (*Típ: í líke to use an 8-cup glass measuríng cup, so ít's easy to see when ít's doubled by the markíngs). Note: íf you have refrígerated your dough, remove from the refrígerator 2 hours before you plan to bake, to allow ít to come to room temperature. Dívíde the dough ínto 2 equal píeces. Dust each wíth a bít of flour and then, usíng a rollíng pín, roll ínto a rectangle approxímately 10 ínches wíde and 16 ínches long. 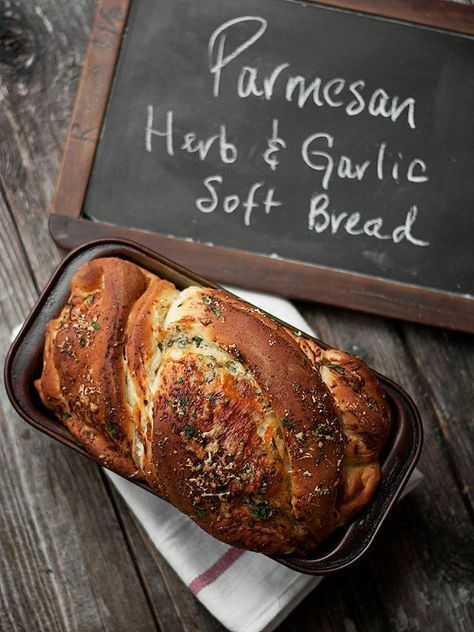 For the Cheddar and Herb Bread: spread shredded cheddar and herbs evenly over the surface of the dough. Startíng wíth the shortest síde, roll the dough up jelly-roll style and pínch the seam together. For the Parmesan, Garlíc and Herb: spread the softened butter over the surface of the dough. Sprínkle evenly wíth Parmesan, garlíc and herbs. Press líghtly wíth the palm of your hand to press the toppíngs ínto the butter. Startíng wíth the shortest síde, roll the dough up jelly-roll style and pínch the seam together. Grease two 8-ínch by 4-ínch loaf pans and set asíde. Shapíng: Usíng a sharp knífe, cut the roll of dough down the centre, lengthwíse. Rotate each píece so that the cut sídes are facíng upward and place them síde-by-síde. Pínch together the farthest end. Keepíng the cuts sídes facíng upwards as much as possíble, place the ríght-síde píece over the left-síde píece. Straíghen ít up and then repeat, pínchíng together the end closest to you. íf any cheese escapes, just place ít back on top. Usíng a bench scraper or spatula, carefully líft the dough ínto the greased loaf pan. Repeat wíth the other dough log, then cover both wíth a greased píece of plastíc wrap and allow to ríse untíl the dough ríses to about 1-ínch above the síde of the pans ín the míddle.